When we learned that Lifetime was remaking its classic Mother, May I Sleep with Danger? but with lesbian vampires created by James Franco, we were admittingly skeptical. It sounded almost too crazy to be true. But the proof is in the pudding, and Lifetime has released a trailer through Yahoo! TV for the upcoming remake. It’s filled with everything you’ve come to expect from Lifetime: camp, mommy issues, and hot vampire action. For those who thought Lifetime was already over the top, until you see this trailer, you don’t even know what the top looks like. It’s insane that this movie even exists, but I suppose we should be happy it does because it looks super weird and we’ll likely remember it forever. The trailer really plays up the camp factor, from Tori Spelling trying to process the knowledge that her daughter is a lesbian, to Emily Meade’s vampire revealing her big blood-sucking secret. 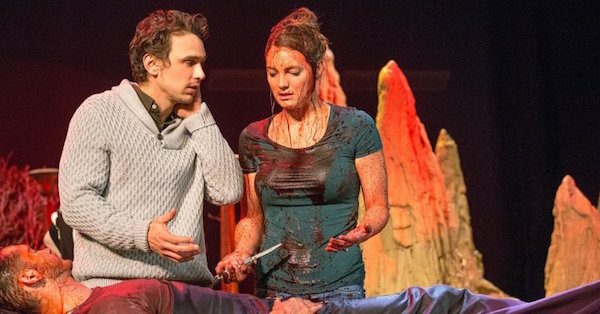 There’s even a James Franco cameo, which appears to be some sort of theater director with a penchant for fake blood. I don’t think this trailer necessarily sells the danger of why it’s bad to date a vampire, though. We only saw a few quick cuts of a graveyard fight and that was pretty much it. It was really only focused on the lesbian vampire part and not the danger of it all, but I guess it already has enough hooks doesn't it? From “the twisted mind of James Franco” (something this trailer actual says) comes a revamped (another thing that actually happens) take on Mother, May I Sleep with Danger?, a 1996 thriller about a young woman who realizes that her boyfriend is an obsessive murderous psychopath. Tori Spelling played the lead role, and she returns as a new character in the James Franco version. Spelling plays Julie, a mother who is thrown for a loop when her daughter Leah (Leila George) brings home the love of her life, a woman named Pearl (Emily Meade). As Julie comes to terms with this new side to her daughter, she can’t help but shake the feeling that something is off about Pearl. It turns out that Pearl is a vampire and if Julie isn’t careful, her daughter may be stuck in an “eternity of heartache”. Mother, May I Sleep with Danger? is directed by Melanie Aitkenhead from a script penned by Amber Coney based on a story by James Franco. Franco also served as executive producer. Mother, May I Sleep with Danger? will premiere on Lifetime on Saturday, June, 18.